Do you smell gas in your home or workplace? Gas leaks not only cost you money, but they can be fatal as well. Known as the silent killer, gas can knock you unconscious and kill you in a matter of minutes. The most damaging thing leaking gas can cause is an explosion. 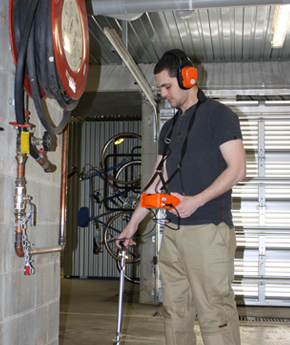 Water Leak Detectors is a Leak Detection company based in Melbourne, Victoria. In case of an emergency, call us toll free: 1800-0-LEAKS-1800 053-257. If you smell gas, get out! Natural gas is odorless, but gas companies have added a pungent smell to it, more like rotten eggs. If you detect this smell and can hear hissing sound coming from gas appliances, that’s a sure sign of a leak. When you suspect a gas leak, give it prompt attention. Delaying gas leak detection is not worth the risk. Ignoring the problem is not only dangerous but can lead to several other problems as well. Don’t wait for an explosion to happen! However, you should never attempt to fix the problem yourself. This is highly dangerous. Contact Water Leak Detectors for help. Our technicians will locate and fix the problem for you. In addition, we will make sure other related problems are corrected or prevented. Water Leak Detectors is a licensed and experienced gas leak detection service provider. Headquartered in Melbourne, Victoria, the company consists of a team of highly skilled and trained technicians. Our years of experience, expertise and professionalism assure you of quick responses to your gas leak problems. In addition, we use only the most advanced gas leak detection equipment to ensure a non-invasive non-destructive accurate solution to your problem. We offer 24 hour emergency gas leak detection service. Call us today!